Dunolly is a rural township in central north-western Victoria, 50 km west of Bendigo and 150 km north-west of Melbourne. 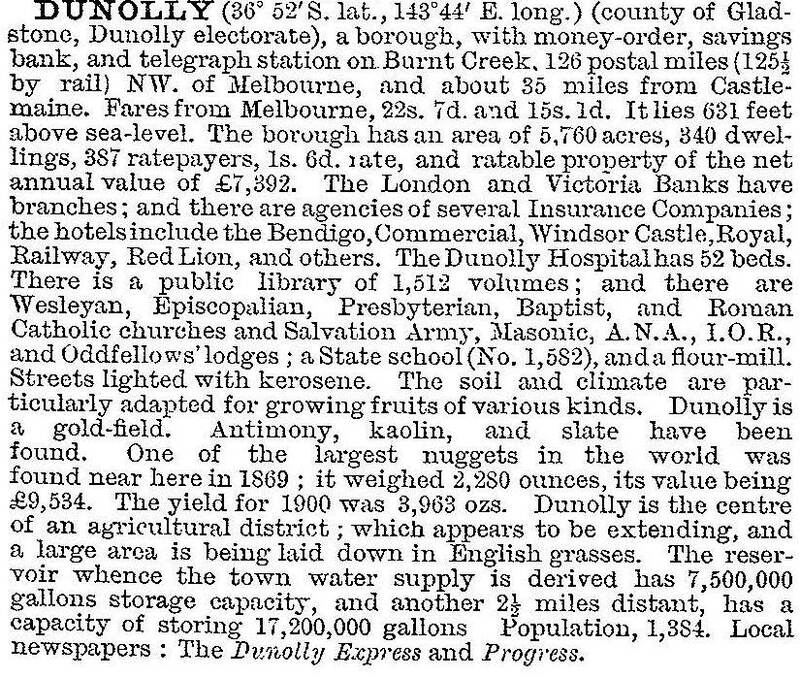 Dunolly was the name of a pastoral run taken up by Archibald McDougall in 1845. He named it after Dunolly Castle, Oban, Scotland, the seat of the McDougall clan. 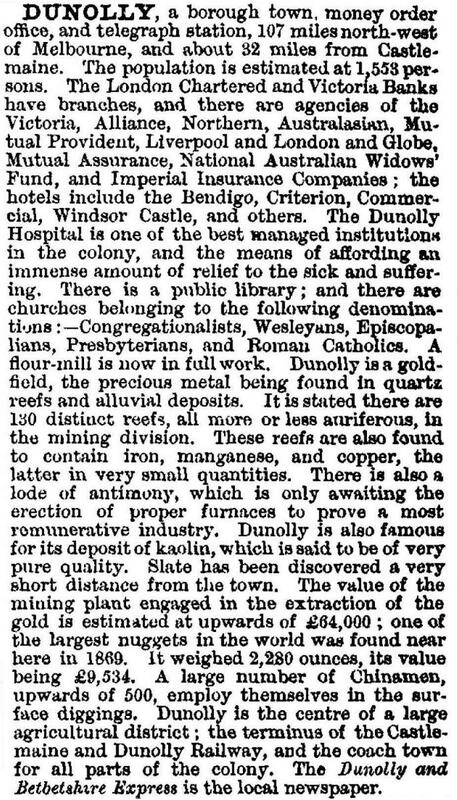 In 1852 gold was discovered at Moliagul, about 14 km north-west of Dunolly. McDougall's run was about midway between Moliagul and Dunolly, and in 1854 he sold it to Henry Simson who subdivided it for settlement. However, gold seekers moved through and beyond Simson's subdivision, uncovering rich finds, concluding at a particularly rich field in 1856 north of the future township of Dunolly. This place became known as old Dunolly. The miners more or less followed the valley of Burnt Creek, which runs in an arc around the west and south of the present township. The Moliagul-Dunolly region became renowned for large nuggets, and recorded the largest per capita gold production of any mining town in Victoria in 1857. The Burnt Creek mine exploited reef gold and had a life of 22 years. A police camp was established at old Dunolly, but the permanent township was surveyed further south. It grew quickly. An Anglican school was opened in 1857, and a borough council was proclaimed on 21 May 1858. A hospital was built in 1860, and additions were made to it during the next 70 years. Dunolly was a rail terminus from 1874 to 1878 and has been a rail junction for the Inglewood and St Arnaud lines since 1888. This made it an important wheat transhipment point when the northern and Wimmera wheatlands later came into production. Before that happened, Dunolly's hinterland was agriculturally productive and the town did not suffer badly from the decline of mining. In 1893 a large flour mill replaced the earlier one (1873) and there were industries such as a foundry, brick works and a soap factory. In 1884 a new court house was built. Three years later it was exchanged for the Dunolly town hall building. The town hall (originally the court house) in the Broadway and the court house (originally the town hall, 1862) in Market Street are listed on the Victorian Heritage Register. In 1908 country races were replaced by a golf club on the racecourse. Dunolly's population fell by nearly one third between 1911 and 1921, and on 1 November 1921, the borough was united with Bet Bet Shire. Twenty years later Dunolly came into war-time prominence when a massive grain storage shed was built near the railway junction. It was enlarged in 1943, reaching dimensions of 520 metres by 74 metres. Described as the largest shed in the world, it was internally supported by forest-wood poles and called a stick shed. It was demolished in 1987. Its nearest copy is a stick shed at Murtoa. Both have been termed 'cathedral like' when viewed from inside. A goldfields museum was opened in Dunolly in 1966 and a motel was opened in 1988. Dunolly was unfortunate in the 1980s when the annexe factory of the Maryborough Knitting Mills was closed (1980) and railway passenger services ended. During the 1990s government lands and conservation offices were closed, the Council offices were closed when Bet Bet Shire was united with Central Goldfields Shire and the last bank closed in 1998. Only local agitation kept open the 13-bed hospital. In addition to historic buildings already mentioned, the Anglican church and vicarage (1864-69) and the Catholic church (1871) are on the Register of the National Estate. The town hall and war memorial are striking reminders of civic pride, and many commercial buildings along the Broadway are intact examples of nineteenth century architecture. There are still bulk grain storage facilities, along with tennis courts, a swimming pool (1956), a bowling club, a recreation reserve, a football club, a hotel and a caravan park. The school had 130 pupils (1998) and 80 pupils (2014). The museum/tourist information centre has details of historic walks around Dunolly. A goldrush festival is held annually on Melbourne Cup weekend and there is a well-attended monthly market along the Broadway. At the 2011 census the median age of residents was 55 (Australia 37 years).